The BX200 is one of the least expensive SSDs around, but you basically get what you pay for. (+) Bargain Hunting: Low price per GB; much faster than HDD for random IO. (-) Dumpster Diving: Slower than most other SSDs; short warranty; TLC endurance. Sometimes a product comes along that blows your socks off and leaves you breathless. This unfortunately is not that product, at least when we’re talking pure performance. Crucial has been a player in the SSD market for some time now, and they’ve been one of the driving forces in lowering SSD prices. Their MX100 line for example was the first time we saw anyone offer a 1TB class SSD for under $600, thanks to their early deployment of 16nm NAND, and the drive was extremely successful. Their BX100 targeted even lower price points, while MX200 improved on the performance of MX100 without increasing the price much. Now we have a new value option from the company that has been pushing for ever-lower SSD prices, the BX200. What sets the BX200 apart from the earlier Crucial offerings is that this is their first ever SSD with TLC-based NAND. We’ve discussed this before, but to quickly recap, NAND comes in a variety of options. The simplest (and most expensive) is SLC NAND, where each cell represents a single bit, using two stored voltage states. MLC doubles the bits per cell to two, using four stored voltage states, and as you might guess TLC increases the bits yet again to three, this time with eight voltage states to track. And there’s the rub: more in this case isn’t better, as NAND gates eventually wear out with use, so SLC lasts the longest (all other factors being equal) while TLC has the lowest durability. There are other concerns with TLC, like the need for more complicated firmware to handle reading and writing, wear leveling, etc. However, if you can overcome all of these difficulties, the potential payoff comes in dollars. Where a 256GB SLC drive would need 256GB of raw NAND capacity, a 256GB MLC drive could get by with half the raw NAND capacity, and a 256GB TLC version could use one-third the raw NAND. Combined with 16nm 128Gb raw NAND die, that could mean very competitive price points. That’s not the whole story, however. As with all SSDs, Crucial has some spare NAND set aside to improve performance and longevity. Second, Crucial specifies 6GB of NAND as an SLC buffer. The idea is that for many workloads, the drive will write to the SLC buffer very quickly, and when the drive is idle it can flush the buffer to the TLC NAND. For the 480GB model, Crucial sets aside 6GB of NAND as SLC, while the 240GB and 960GB models allocate 3GB and 12GB of SLC NAND, respectively. The drive itself has eight packages on the 480GB model, each with 64GiB of raw capacity, with 512MB of RAM cache supporting the Silicon Motion SM2256 controller, running custom Crucial firmware. We don’t know the internal configuration of the NAND packages, but most likely each has part configured as SLC with the remainder running as TLC. Crucial doesn’t disclose the exact amount of overprovisioning, but there’s more spare NAND than in other modern SSDs. It’s likely needed, since TLC can’t handle as many Program/Erase (P/E) cycles as MLC NAND. All of the above is basically secondary to the real question: How does the drive perform, and is it worth the asking price? Here’s where things get a bit complex. At the original MSRP ($150 for the 480GB BX200), the price would have the BX200 competing with the Samsung 850 Evo 500GB. Considering you get 20GB more capacity, we would want similar performance. Street prices on the BX200 however are quite a bit lower, currently $130 for the 480GB model. That makes this the least expensive modern SSD, at least on the midsize model, and it’s one of the few SSDs selling below $0.30 per GB. That brings us to the performance. Our standard SSD test bed uses a Skylake i7-6700K with an Asus Z170-A motherboard. You can read more about our testing methodology, and the full specifications of our test bad are in the table below. For our performance comparisons, we’ve highlighted the Samsung 850 Evo 2TB drive alongside the BX200, as the 500GB and 1TB 850 Evo perform at nearly the same level as the 2TB model. The other TLC-based SSDs in our benchmarks include the Corsair Neutron GX and the OCZ Trion 100, both using the Phison S10 controller but with different NAND/firmware, so keep an eye on those. And just for comparison, we’re tossing in a 3TB Seagate HDD—you’ll find out why in a moment. Samsung initially impressed the world with their 840 Evo line’s TLC performance, though the problems with drives becoming slower over time soured the deal. The heart of the issue with 840 Evo is that accessing “old” (nine weeks or older) data becomes slow due to voltage drift. In short, there’s a drop in voltage where the stored charge in the NAND cells degrades over time. This happens on all NAND to varying degrees, but it was worse on the 840 Evo. The fix involves reading and refreshing cells with old data periodically, which is done in the background while the drive is idle. It looks like the use of 19nm TLC planar NAND made this a bigger problem than on other NAND (e.g. 19nm MLC), and the better solution comes via the upgraded 850 Evo line. By using V-NAND and stacking 32 NAND layers using an older process node (40nm), the size of the NAND cells can be much larger and voltage drift is far less of an issue. There’s just one problem: V-NAND is currently a Samsung-only solution. Where does that leave other TLC drives? Back at the difficult task of dealing with voltage drift on smaller process NAND. So while Samsung’s 850 Evo screams along at performance levels very close to that of their 850 Pro (see our 2TB 850 Evo and 2TB 850 Pro reviews), we haven’t seen TLC solutions from other manufacturers come anywhere near the performance of the 850 Evo—and that includes the Crucial BX200, which sadly ends up being slower than virtually every other SSD we’ve tested. We had high hopes for the BX200, considering the BX100, MX100, and MX200 have all performed reasonably well. Unfortunately, the change to TLC results in pretty severe drops in performance. One thing you can’t really see with the charts is that the performance is initially quite a bit better, which means on less demanding workloads where the SLC can service all requests, the BX200 does pretty well. Heavier workloads on the other hand exhaust the SLC buffer and write directly to the TLC NAND, and in some cases performance can approach that of a conventional hard drive (e.g., large sequential writes). You can see this happen in the following image, showing throughput of a Windows copy operation; the BX200 starts at over 300MB/s, but after the SLC buffer is exhausted, write speeds drop to around 75MB/s. Looking at the competition, the BX200 primarily goes up against the Trion 100, and it wins some tests and loses in others. Overall, the BX200 ranks behind the OCZ Trion 100, and both of them trail well behind faster SATA SSDs like the OCZ Vector 180 and Samsung 850 Evo. Initially, the Trion 100 targeted the same price points as the 850 Evo, but street prices have come down since launch. 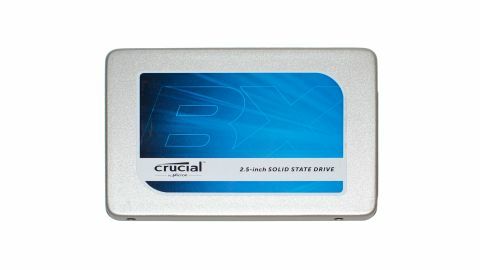 The Crucial BX200 480GB has a $130 street price, matching the Trion 100 480GB, and depending on your workload the BX200 may prove more effective. We’d still much rather spend the extra $27 to get the 500GB 850 Evo, but at least there are some savings to be had. Looking at the bigger picture, it’s great to see 500GB-class SSDs now selling below $0.30 per GB. For users that don’t need a ton of storage, we’re at the point now where laptop makers can legitimately look at using a 500GB SSD for roughly twice times the cost of a 1TB 7200RPM HDD. Considering all the benefits of solid-state storage, we see little reason to ever go with conventional storage for your OS drive on any decent PC. This is particularly true of laptops, where the ubiquitous 5400RPM hard drives are even slower, leading to long-term problems and increased failure rates in our experience. What remains to be seen is whether or not Crucial is able to improve the performance of the BX200 with firmware updates. We’re looking at the initial release, and given other TLC SSDs perform better without an SLC cache, it’s possible Crucial can further optimize things. We can’t recommend a product based on what may or may not happen, however, which leaves us with an inexpensive SSD that is merely okay. If you’re building a PC for your parents or grandparents and you know they’re not going to do any strenuous workloads, there’s little difference between the experience of using the BX200 and using a faster SSD, but there’s still a big jump relative to hard drives. That’s the market Crucial targets, and they’re a good fit for undemanding users; enthusiasts on the other hand will be better served by a faster SSD.